Can Vegetables Grow Year-Round In The Greenhouse! You betcha! Most vegetables can be grown in a greenhouse year-round, but not without a little help from you. Creating the perfect growing environment in which vegetables will grow can be a challenge though, with heating during the cold season and cooling in the warm, monitoring the greenhouse is essential for the plants' growth and your success. First we should start by understanding some greenhouse lingo. Cold greenhouse, cool greenhouse and warm greenhouse are common terms you'll see quite often. They aren't three different houses, only one with different temperatures maintained inside. Just a note, these minimum temperatures represent night temperatures, not temperatures maintained during the daytime. 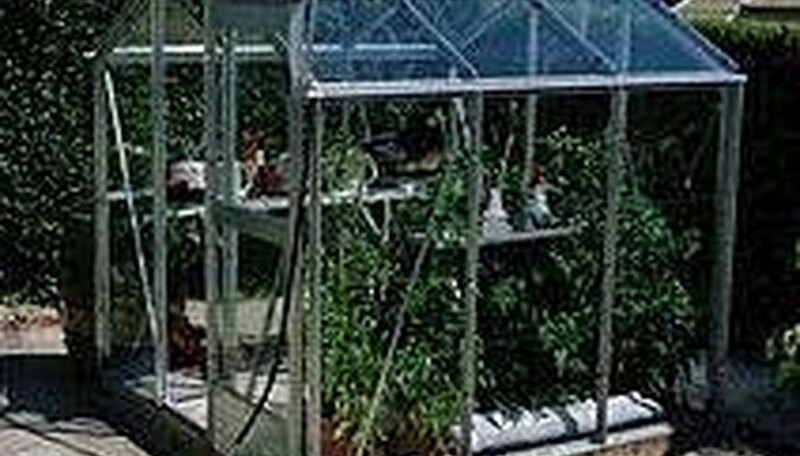 The sun heats a cold greenhouse and usually has a minimum temperature of 28 degrees F maintained. No growth occurs in this type of house but you can over winter plants that are not frost sensitive. Cool greenhouses are heated during the cooler months either with gas, oil or propane to a minimum temperature of 45 degrees F. This is just warm enough for a little plant growth and frost sensitive plants can be over wintered here. A warm greenhouse is where all the action is. This house is heated at night during most months and a minimum temperature of 55 degrees F is maintained. A wide assortment of plants can be grown during the winter, including exotic varieties and most vegetables. The one drawback to growing year-round in a warm greenhouse is the heating cost, which can be high for someone living in an area with a long winter season. Maintaining 55 degrees at night during the winter can be a little costly. There are ways to cut down on heating costs and we will discuss them in future articles. Cooling a greenhouse during spring and summer, where temperatures can reach well over 100 degrees, is just as important. Tomatoes for example will stop growing when the temperature starts to inch toward 90 degrees. Why would a person be willing to heat a greenhouse to grow vegetables? If you live in an area with a short growing season, the cool weather could be upon you right when warm weather crops like tomatoes and peppers would be at their peak. A greenhouse extends your short season so you too can enjoy a red ripe homegrown tomato. You can have an earlier crop, for example, harvesting in June instead of July or August. Tender varieties, which otherwise may not grow in your area, can be grown and enjoyed. What vegetables can be grown in a greenhouse? Peppers, cucumbers, beans, eggplant, melons, squash and of course tomatoes do quite well. Carrots, lettuce and radish can also be grown inside. When searching through catalogues for seeds, look for varieties made specifically for greenhouse production. They will have qualities that will make growing them easier for you and assure your success. For example, 'Alicante' tomato is meant to grow in a cool greenhouse because it can tolerate cooler temperatures and 'Tornado' is an excellent bush type that stays compact, a good idea for the greenhouse. Seed starting dates vary according to the vegetables grown and the type of house you are maintaining. For tomatoes growing in a warm greenhouse (min 55 degrees) start seeds in early January, transplant in February or early March into grow bags (bags filled with a lite soil mix made especially for greenhouse vegetable growing) or plant into 5-gallon pots, then place them against the south side of the greenhouse. This area will get the most sun and heat during the day. You will start harvesting your crop in June. For a winter crop, start your seeds by July 1, transplant to bags by mid- September. Both pepper and cucumber seed are started in late February, transplanted in April for a late June harvest. Place these also on the south side. Make sure to shade your greenhouse starting in spring and continue through summer as the temperatures can soar to 100 degrees quickly. All of these plants are going to need support at planting time. Tie stems to bamboo stakes. Pollinating the crops becomes your job, as there are no bees inside to do the work. To pollinate tomatoes, tap on the bamboo stakes once in the morning and once at night when you notice the petals of the flower are curved back. You will have three days to achieve pollination once you notice the flower petals are curved. During the summer, try to maintain a temperature of 80 degrees during the day. Venting and shading will be necessary to accomplish this. Remember everyone's season is different, so grow according to your areas climate. Manipulating the environment by heating in fall and winter and cooling in spring and summer will insure the proper growth of your vegetables so you can be harvesting all year long.